Welcome to my Extreme Force week! Today is kind of a crap shoot (for which I apologize) but the rest of the week I think is pretty solid. Oops! is a very simple Trap card. Normal Trap here, that lets you Target a card you control, and destroy it. Here’s the thing about this…there are definitely cards that do this better and easier, and there are cards that do this harder and worse. 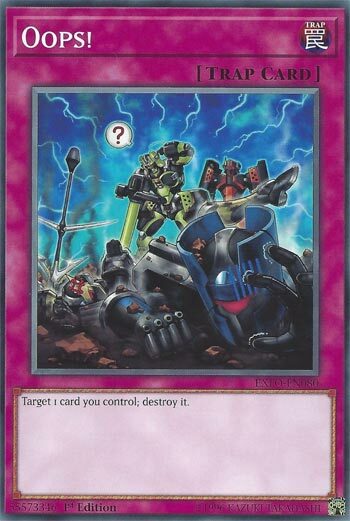 It can be useful certainly to destroy a card of your own, especially if it grants you a Draw, a new Monster, damages your opponent, whatever the situation may be. But realistically, you probably about ever, aren’t going to have room in your Deck for a card that functions with this as its sole purpose. It’s not worthless or useless, it’s just not exactly worthy or useful, either. Oops! is an “oops!” of a card. A negative 2 before any benefits from destroying your own card kick in is not something you want in a card. There are plenty of cards that are a 1-for-1 that destroys your card, then an opponents, then you can benefit from your own cards destruction with only a -1. Really short, but this is a simple card: don’t use it. Well looks like we have an accident on our hands, Oops! Oops! is a Normal Trap card that lets you target a card you control and destroy it. Hmmmm… let’s see. You could destroy a card to trigger Astrograph Sorcerer… no, Electrumite does that better. You can trigger a Burning Abyss… eh, they don’t really struggle with that. Trigger a floater that can be destroyed by card effect… cards like that should be easy to destroy already though. Yeah, I’m stumped here. The uses are there, but they are very niche and there are already better ways to achieve those conditions. Art: 2/5 Alright, what happened here guys? I’m wondering if Konami had a Bring Your 5 year old Child to Work Day when they were designing these cards.